The following introduction was taken from the project summary page made as an early part of the project. 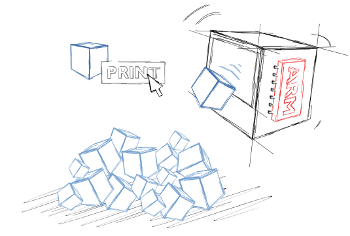 3D Printing is a manufacturing method that allows digital designs to be automatically fabricated into physical objects. While 3D printers have existed for some time, they've recently become available to hobbyists. The first step of nearly any 3D printing process is to slice up the design into thin layers (see figure). These layers, when stacked on top of each other produce a close approximation to the original shape. This is analogous to the way individual dots printed by a regular printer approximate the shapes of letters and figures. The next step is to "print" out each of these thin layers on top of each other to produce the desired shape. There are many popular ways to do this however most hobbyist printers use Fused Deposition Modelling (FDM). In this process, a filament of plastic is melted and spread over the required area. In my project I aim to replace the electronics of a MakerBot 3D printer with a more powerful ARM-based micro controller. This will allow a TCP/IP interface to be developed and a more extendible firmware to be developed. The network interface will offer significant speed benefits over the current serial link allowing more intricate designs to be streamed to the printer. The more powerful processor allows a real-time operating system to be utilised allowing a cleaner software architecture.